Customer Issue: The electric operator was working, but the gate didn’t open. Our Solution: The safety sensors were intact, so we checked the Eagle EG167 plug-in loop detector and discovered it had locked out. To solve the problem, we reset it and the testing showed it worked properly. 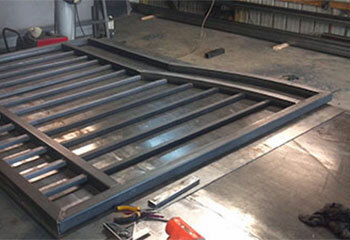 Customer Issue: Our customer wanted a powerful and reliably working swing gate opener. Our Solution: The large and heavy gate required a more powerful motor and we recommended the Elite CSW200-1HP opener. We secured it firmly to the platform, connected the hardware and programmed the controls. Customer Issue: One of the swing gate’s posts was slanted preventing normal opening and closing. 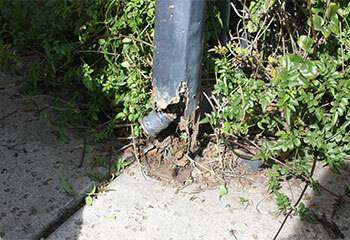 Our Solution: The footing was not appropriate for the type of soil on the customer’s property, so we replaced it and secured the post firmly in straight vertical position. Customer Issue: The motor was making a buzzing noise, but didn’t open the sliding gate. 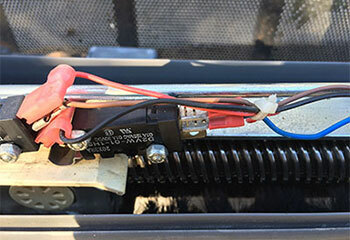 Our Solution: We checked and tested the Ramset 100 UL 1/2 HP opener, revealed the start’s capacitator had burned out and replaced it with a component matching the model. 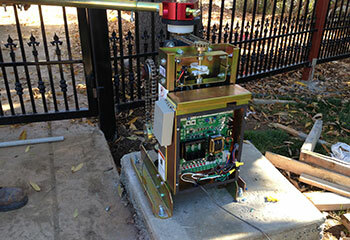 Customer Issue: Mr. Nelson wanted to make his driveway gate more secure with an intercom. 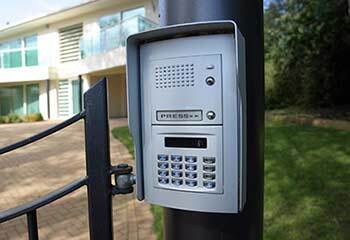 Our Solution: We helped our customer choose the advanced AiPhone JK-Series video intercom system for access control and installed it to work with his sliding gate and opener. 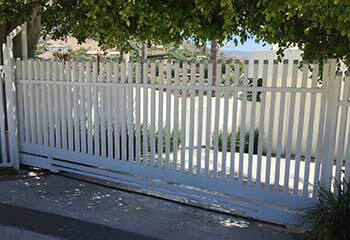 Customer Issue: The sliding gate went forward and then reversed, while the opener was working normally. Our Solution: We inspected the hardware carefully, found a broken wheel bearing and replaced it with a new one of the same diameter and thickness. 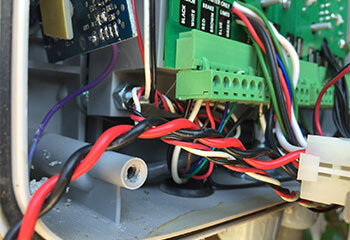 Customer Issue: The DoorKing 6100 swing gate opener was noisy and did not work smoothly. Our Solution: After opening the cover, we inspected the components closely and found plastic shavings under the rim gear indicating it was misaligned. We adjusted it accurately and greased the housing below the gear assembly for optimal performance. Customer Issue: There was too much slack in the driveway gate chain, despite it being fully tightened. Our Solution: We removed three links to reset the tensioners and then tensioned the chain to give it the slight sag required for normal automatic gate operation. 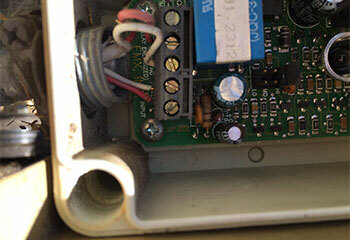 Customer Issue: The DoorKing 1802-EPD intercom had failed completely. 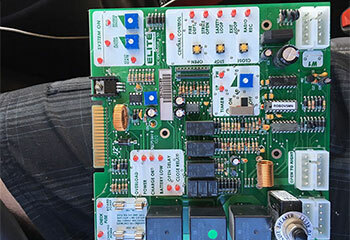 Our Solution: The intercom didn’t receive power and our test with the voltmeter showed the power adapter was damaged, so we replaced it with a new one matching the system’s specs. Customer Issue: The opener wasn’t working as fast as usual and was making strange noises. 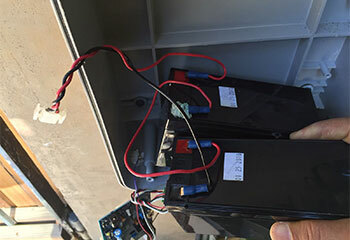 Our Solution: Our test revealed that the V-belt of the LiftMaster RSW12U swing gate opener was loose and cracked, so we replaced it with a new one having the same specs.